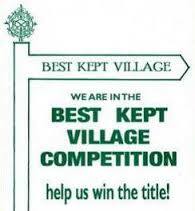 It is some years since Edington entered the Competition which is open to all villages in Wiltshire. The Parish Council intends to do so this year and hopes that all residents will participate in assisting it to maximise the chances of success. The Competition is initially based on the areas of the old District Councils and is separated into small, medium and large categories: hence Edington will be competing with other villages in West Wiltshire with a population between 300 and 1000. Based on past years, it is likely that around a dozen other villages of similar size in West Wiltshire will enter the Competition so the “opposition” will be challenging. Our entry has to be submitted by the end of April and will be judged sometime during the period mid May to mid June: it will be based on our written submission and a site visit. This will focus, primarily,on looking at communal buildings and public areas such as village greens, footpaths, car parks, noticeboards, bus shelters etc. The judges will be looking for evidence of a vibrant village which puts time and effort into its Clubs and Organisations and keeps litter and general untidiness to a minimum. However, it is emphasised that it is not a “chocolate box” competition so Edington is not at a disadvantage in this respect. To see what the judges will be looking for click on here to see the mark sheet.